Brent Sebold, venture manager for ASU’s Edson Student Entrepreneur Initiative, got to do what he loves best this week. On Monday, he sent out 20 emails notifying anxious startup founders that they had survived the final round of judging and were being invited into the Edson Accelerator Program at ASU SkySong. That prestigious invitation brings with it up to $20,000 in seed funding, a year’s worth of office space in the SkySong facility and an intensive, mentor-led acceleration program. This year, 340 startup teams, representing more than 1,000 ASU students from all university disciplines, applied to be accepted into this year’s cohort. Those 340 were narrowed down to the top 30, who then pitched to an independent panel of judges comprised of Valley business leaders and successful entrepreneurs. The judges then chose the top 20 companies to receive funding and support via the Edson program during the next 12 months. “We could not have funded such a dynamic cohort of startups without the tremendous support of our large cadre of first-round judges and our dedicated finalist judging panel,” Sebold said. “Not only did these folks give up a lot of their personal time to review first round proposals, they also provided an unprecedented amount of valuable, practical feedback to these aspiring entrepreneurs.” Sebold also gave a nod of approval to the Kauffman Foundation’s iStart platform which provided an efficient, online environment to manage the entire application and judging process. The 26 startups in the previous Edson cohort will be wrapping up their time in the program on June 30. These companies have amassed several impressive accolades in their tenure in the Edson Accelerator. Their accolades include: Entrepreneur Magazine’s College Entrepreneur of the Year winner, Inc. Magazine’s Coolest College Startup in America winner, Sweden’s “Idea to Product” global entrepreneurship competition winner, and Department of Energy Phase I SBIR award recipient, to name just a few. The startups are finding business success as well, with nearly one-third of the companies in revenue and a combined total of $300,000 raised in additional funding and grants. With those big shoes to fill, the 2012-2013 Edson Cohort has a lot to live up to, and Gordon McConnell, executive director of Venture Acceleration for ASU Venture Catalyst, thinks the incoming group will do just that. AlphaStripe is a global, online networking platform for military service members, military families, civilians and humanitarian organizations to share war-time and conflict zone stories in video, photo, audio and journal formats. Open to military personnel and civilians the world over, AlphaStripe has developed a detailed database of military branches and service units, enhancing the social connections made when their members create profiles and upload content. AlphaStripe gives their members an opportunity to save history, record memories and make connections through their unique combination of popular social media outlets. BlockLight aims to become the leading software provider in educational and professional performing arts by improving current methods of preparation and practice. Its first product, Stage Minion, is an iPad application for performers, directors, choreographers and stage managers that will revolutionize the way that show plans are created, documented and shared. Custom Aeroponics manufactures and sells aeroponic components to urban agriculture growers, from restaurants to individuals, who want to reduce waste water, fertilizers and increase food quality while minimizing growth time. Unlike AgriHouse or Aerofarms, we use FDA and USDA approved recyclable materials, bacteria and bio-film resistant components, and increase plant density through our unique design, giving our users a more reliable, efficient and eco-friendly system. FlashFood is a smartphone application and website designed to reduce food waste and feed the hungry. When the manager of a business has leftover food at the end of the night, she can create a post on our network which will notify a group of volunteer drivers to pick up the donation and deliver it to a local community center, such as a school or church. Meanwhile, qualifying subscribers to the network will receive a text alert of when and where they can pick up the donated meals. G3Box sells medical clinics made out of converted steel shipping containers to nonprofits and NGOs that work in healthcare development and disaster response who want on-demand, fully-functional medical space for their needs. Unlike container conversion companies and nonprofits that convert containers to clinics, we capture a health care market, do not rely on a volunteer and fundraising model, and have a scalable and standardized manufacturing plan. Innovative Healthcare Technology sells EZ PT, a virtual physical therapy program using Kinect technology, to therapists, physicians and patients who will benefit from a home therapy program that provides feedback and tracks patient compliance and performance accuracy. Unlike the status quo, EZ PT provides immediate and consistent feedback, resulting in a more effective physical therapy delivery program, with significant cost savings. KVZ Sports LLC is a fully integrated design and manufacturing company that provides apparel products, on demand, to action sports clients who are looking for unique ways to promote their destination or brand and lower their inventory costs. Unlike our competitors we manufacture most of our products here in the United States with much shorter lead times and the ability to deliver mid-season re-orders. Stocking inventory for them is no longer a "one-shot-deal" that needs to be finalized pre-season. Late Living provides video tours of assisted living facilities to senior citizens and their families who want the ability to search for assisted living care without leaving the comfort of their own home.Unlike the current approach and other online directories, Late Living is the first to offer full video walkthrough tours, room availability, Facebook integration, and direct facility contact wrapped into an easy to use website. Our approach saves time, lowers stress, and aids the facilities in locating new patients they would have never otherwise found. Mercury Innovative™ creates unique language arts and analysis software for kids & their parents, educators, and researchers. Our Text in Motion (TIM) software makes reading and writing fun and interactive for children. Our other software, called Rhetoristics®, allows communications researchers to create and analyze language models of audiences and communities. PhycoLogial produces omega-3 enriched algae and algae oil for people who want health hearts and healthy pets. Unlike omega-3 from fish-oil our omega-3 production is sustainable and mercury free and is produced from waste nutrients using natural sunlight to lower cost. Pollination Providers provides artificial pollination to growers who want more control over pollination and yields. Unlike bee pollination, our process does not rely on weather or healthy bee hives to create substantial agricultural yields. Quester Galleries is a downloadable photo slide show software that creates embeddable image galleries for use in digital news venues. This technology is designed by photojournalists for photojournalists. Quester Galleries provides a simple, clean and functional option for online news companies to display compelling photography, allowing the user to focus on an image - not a poorly designed gallery. Because the technology is integrated into each website’s html, the gallery also can improve search engine optimization and web traffic analytics. SafeSIPP is a more-than-profit venture simultaneously solving two problems facing rural communities in the developing world: transportation and purification of drinking water. SafeSIPP has designed a portable water purification system to sell to non-profit organizations and social enterprises that have established connections and relationships with rural communities in the developing world. Unlike others in the market, who only transport water, SafeSIPP adds value by both transporting and purifying large amounts contaminated water. Seymour Enterprises provides Ella’s Monitor, a revolutionary, low-cost device that will save infants from Sudden Infant Death Syndrome. Unlike existing inaccurate home sensors, Ella’s Monitor will offer the accuracy of hospital grade equipment in an affordable, convenient, and easy to use package. SmrtEn provides a subscription service to homeowners to save them 20+% on their energy bill by continuously programming WiFi home thermostats. Unlike Nest Labs, we are a cloud based service whose Artificial Algorithms are extensible to other home appliances. Solar Stream Innovation sells packaged solar solutions to Hotels, Multifamily Housing, Elderly Care Facilities, and Hospitals who want the renewable benefits of Solar Energy with a faster return on investment and back-up power generation. 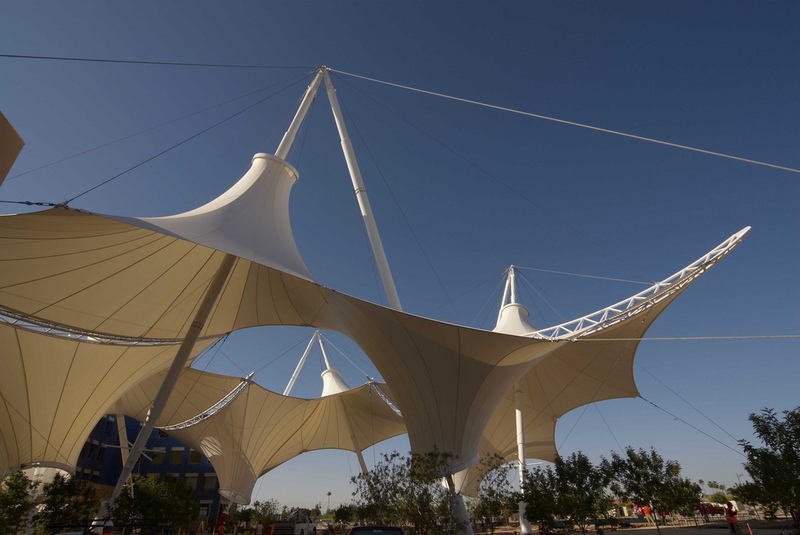 Unlike direct competition concentrating solar power technologies, we use primarily low cost, mass manufactured components to reduce installation and maintenance costs in providing valuable performance. Also, unlike substitute photovoltaic competitors, we offer low cost reliable back-up power generation. Sonoran Biosciences, Inc. is developing antimicrobial technology for hospitals burdened with the high cost of surgical site infections. Our proprietary product's unmatched combination of liquid properties and sustained release will provide greatly improved protection against infection. Vantage Realized improves the quality of life for people with disabilities. Through its first product, the Mechaddy, a lever-operated device that uses a chest press motion to propel a mechanical wheelchair, it will improve mobility for manual wheelchair users who want to prevent carpal tunnel syndrome as well as joint damage from occurring to their rotator cuffs. Veterans Now provides comprehensive and integrated student-Veteran housing communities featuring programs and services to universities who want to recruit, support, and retain Veterans. By providing student-Veteran housing, VETERANS NOW creates a strong Veteran cohort, which facilitates Veteran success as defined by higher university retention and graduation rates. Viomics sells the next generation lung cancer test for doctors and their patients who want to detect it while it is still treatable. Viomics can detect lung cancer early enough to treat, and often cure it, substantially increasing a patient’s chances of survival. ASU was one of more than 50 teams from around the world to test its Moon-mining robot design in the third annual Lunabotics Mining Competition. Arizona State University was one of more than 50 teams from around the world to test its Moon-mining robot design in the third annual Lunabotics Mining Competition. The event was held at the Kennedy Space Center Visitor Complex in Florida May 21-26. The event drew teams from as far away as Bangladesh and Romania and included competitors from all across the United States. Top honors in the competition went to University of Alabama for earning the most cumulative overall points and Iowa State University for collecting and depositing the most regolith. Stinnett was one of four ASU students to travel to Florida for the competition. He was joined by Jim Crowell, Jesse Banks, and Patrick McGarey. All four students are majoring in Earth and Space Exploration with a concentration in Exploration Systems Design. The team roster also includes: David Nelson (Aerospace Engineering), David Darling (Earth and Space Exploration), Michael Anderson (Aerospace Engineering), Jack Lightholder (Aerospace Engineering), Nicholas Lantz (Electrical Engineering), and Pye Pye Zaw (Earth and Space Exploration). Ganesh Kumar, a graduate student, assisted the team, and Professor Srikanth Saripalli served as faculty advisor. The team’s efforts are the latest in a rapidly growing program in robotics and engineering in ASU’s School of Earth and Space Exploration (SESE), which combines science and engineering to produce the next generation of explorers. The team’s lunabot weighed in at 46.5 kilograms and measured 1.5 meters long (with the arm closed), 0.5 meter wide, and 0.75 meters tall. In the first round of the competition, the ASU team had complete control of their lunabot, but they were unable to get out of the rut they started in. In round two, the team was unable to establish communication with the lunabot. 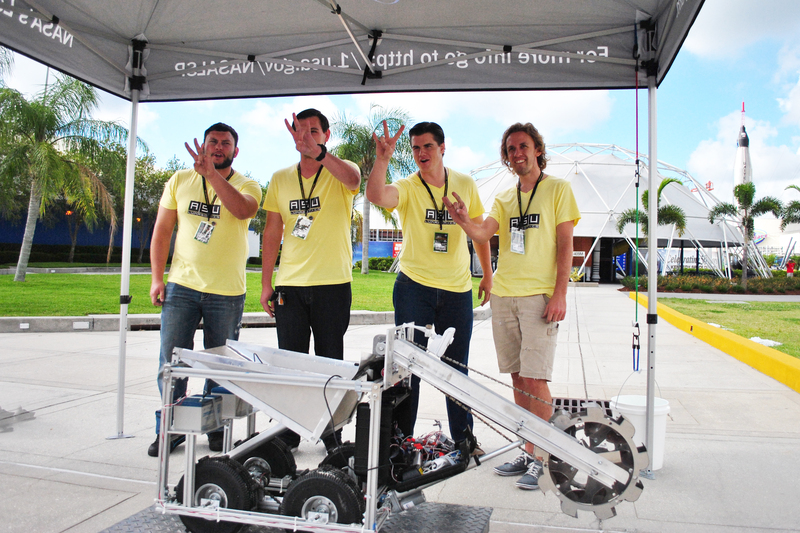 "With the limited resources and time that the lunabotics team had, they performed admirably. They gained valuable real-world knowledge that will be useful for the next year's competition," says Saripalli. “This year was riddled with oversights. We came to the competition with a team of mostly freshmen, with no robotics experience – no one on our team had ever built a robot or competed in a robotics competition – so it was year of growing pains and learning experiences,” says Stinnett. Next year, the team would like to secure more sponsorship so they are not only able to afford higher-quality materials but so that they can bring more people to Florida. “Most of our team stayed back in Tempe providing moral support. It’s kind of sad that we’re here with their hard work and they’re not able to be here with us when other teams have 20 or 30 people with them,” says Stinnett. Budgetary issues were a huge concern for the team. The average budgets for teams in previous years were listed at upwards of $30,000. The ASU team worked within a $5,000 budget. In lieu of monetary contributions, some local companies in the valley supported the team with donations of materials: Microchip donated microprocessors and development chips; IGUS donated plastic parts to protect wires; and HeatSync Labs in downtown Mesa, a collaborative working environment for scientists and engineers, opened its doors to the students and assisted with questions and problems. “Being a part of this competition has made me feel much more confident about going into the workforce and has given me an experience that I can expound upon in interviews. You really do need “real” experience, like this competition provided – projects beyond just coursework,” explains Crowell. ASU’s Lunabotics team is sponsored by its sister organization SEDS (Students for the Exploration and Development of Space), the School of Earth and Space Exploration, and the Autonomous System Technologies Research & Integration Laboratory.